Happy Mother's Day... to all the hard working Moms out there- the ones who faithfully cook, clean, and support their families so that their children can have a good future. As children, we often take our mothers for granted. After all, they are always there to help us and take care of us. It is rare in America, to see women having to resort to the kind of work you see in this photo, though. 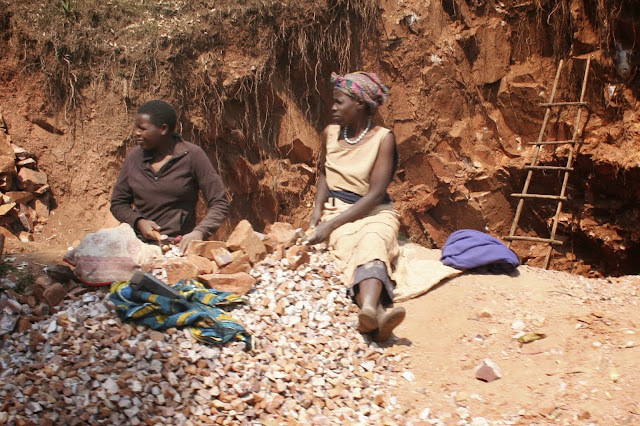 These Ugandan women will spend all day in the hot sun, breaking apart rocks to make gravel for about 3 dollars a day. The road crews come and use the gravel on new roads (something I never gave a thought to before actually seeing this with my own eyes). Hand made gravel. Turn the Page Uganda is trying to make a difference in Northern Uganda, but supplying textbooks to needy schools, so that students can receive a proper education. We hope that children will have a chance at a better career than rock breaking. Something that uses their talent and skills to provide for their own family and community. We have helped 70 schools so far, but there are many more schools waiting for their chance. Won't you consider a tax deductible donation so that opportunity can be extended to some of these waiting schools? Check out our PAYPAL link, or send a check to Turn the Page Uganda, 3723 Dixon Street Santa Barbara, California 93105 USA. You CAN make a difference in the lives of so many needy children!